Prototype: German State Railroad Company (DRG) steam locomotive, road number 18 527, 4-6-2 design with a type 2´2´ T 31,7 tender. Built starting in 1923. Use: Heavy express trains. 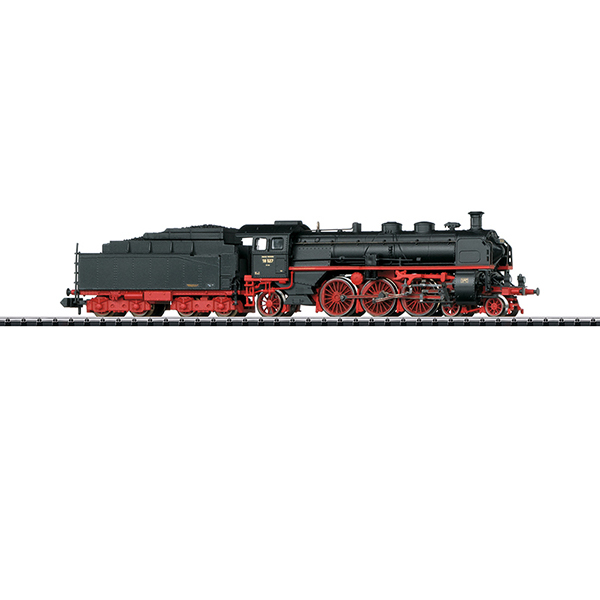 Model: The locomotive and tender are constructed of die-cast metal. The motor and gear drive are built into the boiler. 3 axles powered. Traction tires. The locomotive has a digital decoder for DCC, Selectrix, and conventional operation, built into the tender along with the sound circuit with a speaker. The locomotive has dual headlights that change over with the direction of travel and that can be controlled digitally. There is a close coupling between the locomotive and tender. Length over the buffers 144 mm / 5-11/16".